Africa lags behind in the international trade of Information and Communications Technology (ICT) goods earning just a small percentage from the lucrative sector. The continent’s share of the USD 2.1 trillion in 2017 remained negligible despite the demand for electronic components used in Internet-of-Things (IoT) devices driving the value of trade in international ICT goods in 2017. According to figures released by UNCTAD, trade in ICT goods grew slightly faster than merchandise trade representing 13.4 per cent of the total in 2017. The global market however shrunk from the 16.1 per cent high during the dot-com boom in 2000 but it remained the highest in two years. By comparison, in 2017 machinery and transport equipment accounted for 37 per cent and food for 8 per cent of merchandise imports. “This is the first time that global ICT goods imports have rebounded since 2014, showing a good 6 per cent annual growth and bringing a reprieve to the past two years of decline,” Shamika Sirimanne, Director of the Technology and Logistics Division at UNCTAD, said. 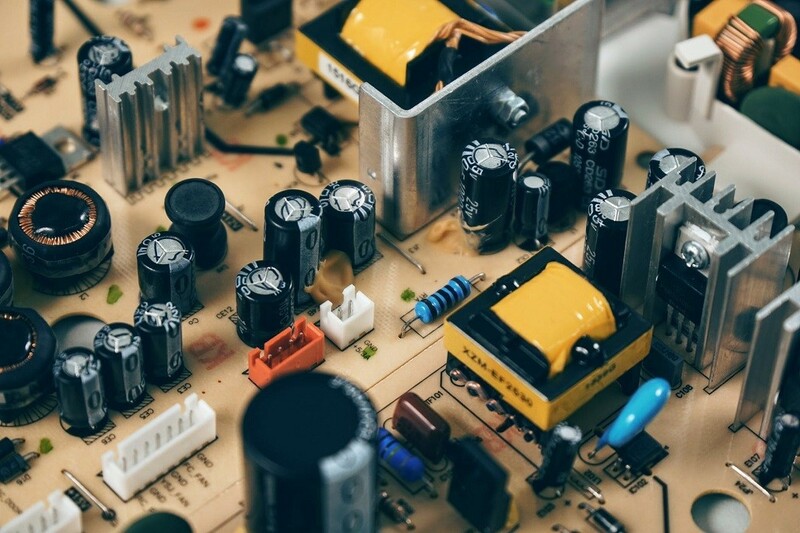 Among ICT products, trade in electronic components continued to expand with an annual growth rate of 8 per cent – just below that of computers and consumer electronics (9 per cent) – and it shows long-term, steady growth. 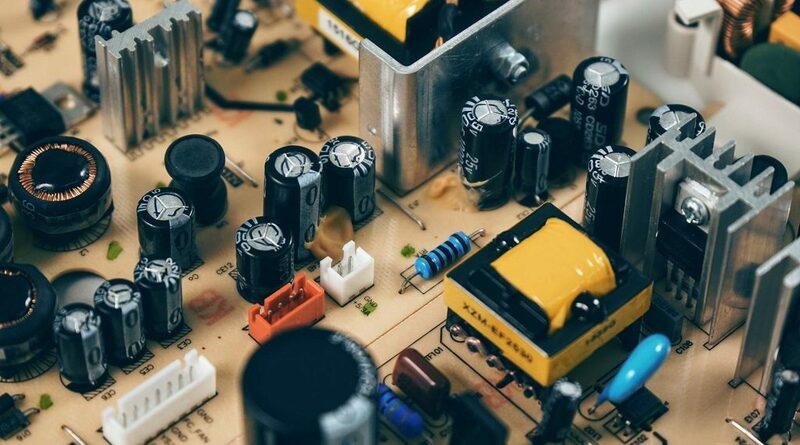 “The expansion of electronic components, which are the basic building blocks of electronic circuits and semiconductors, reflects the fact that more and more products and activities are going digital worldwide. Much of this trend can be associated with the advent of the IoT, which has witnessed unprecedented growth since 2015. This trend may be further accentuated in the coming years.” Sirimanne said. While China is by far the largest exporter of ICT goods, the Republic of Korea boasted the highest growth rate among the top 10 exporters in 2017. Exports also grew significantly for all the other top ten exporters, except the United States. The market share of the top 10 exporters was about 86 per cent in 2017. Meanwhile, the United States is the top importer followed closely by China and Hong Kong (China). Mexico was the only economy among the top 10 where ICT goods imports did not grow in 2017. The share of intra-industry trade remains high in this sector, with interdependence between the big Asian, North American and European players, and the top importers typically also feature among the top exporters of ICT goods. 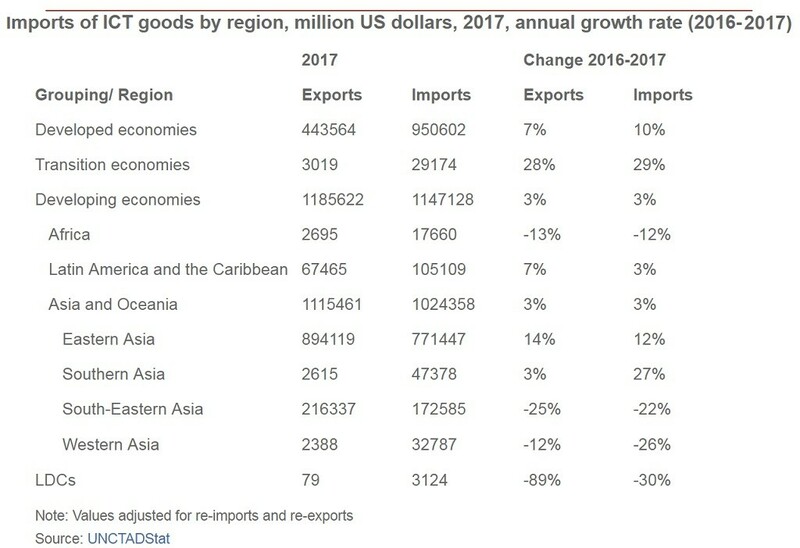 ICT goods imports to developed economies showed 10 per cent annual growth while ICT goods imports to economies in transition in South East Europe, the Commonwealth of Independent States grew by 29 per cent. This growth is significantly more than in developing economies – 3 per cent – while in the 47 Least Developed Countries they dropped by a hefty 30 per cent. In 2017, Eastern Asia accentuated its role as the leading export hub, while Africa, Southern and Western Asia all saw significant declines. However, at 54 per cent market share, developing economies import more than developed economies because they have a more significant role in assembling ICT goods and so import significantly more electronic components. Developing countries also show a stronger preference for communication equipment over computers and peripherals, in line with the implementation of mobile-first strategies. On the other hand, the shopping basket is more balanced between the different ICT product categories in developed economies. You can also read how China is king of creative goods and services and how Kenya’s street children can code as Konza Technopolis targets Kenya’s children for STEM Bootcamp.